As is well documented, the major limiting factor to the output of these engines in their standard guise is the somewhat restrictive inlet manifold/throttle body arrangement. Replacing this with a purpose made, single, butterfly controlled, barrel per cylinder is the obvious way to go. Presented in the simplest form, we find twin side draught carbs on a purpose made manifold. The next step is to replace the carbs with similarly flanged throttle bodies carrying injectors. Logical progression from this point is a direct to head throttle body. This, correctly designed, offers optimum airflow, greater simplicity and less weight than any other system. Slide throttles, taper throttles and roller throttles are all available for these engines, but none of them offer any further worthwhile performance gains especially considering the cost. We have carried out extensive back to back dyno testing with the taper system versus our own parallel bodies and we find no difference anywhere in the power range. Considering the complexity of tapered systems, the simple body is generally the one to use. 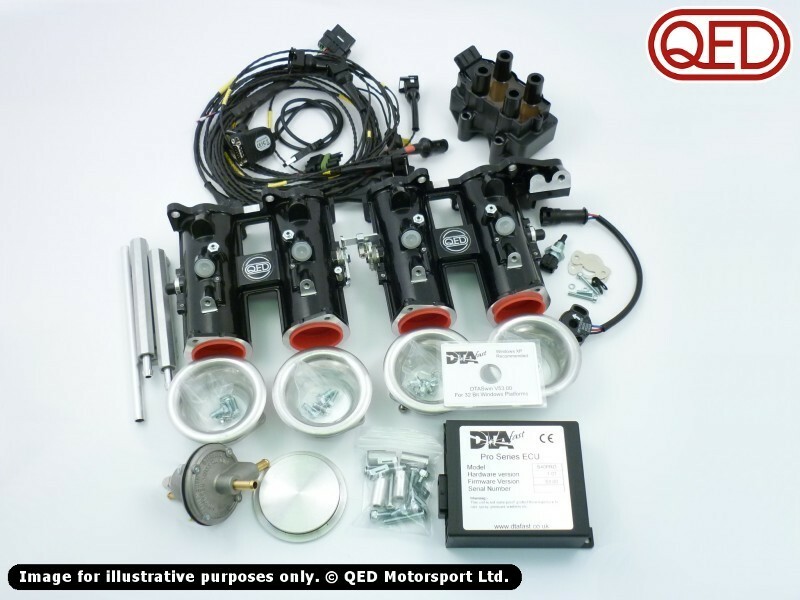 We now offer a management kit that makes use of direct to head throttle bodies and the DTA engine management system. Designed with simplicity as well as effect in mind the TBM/DL kit allows any competent engine builder an affordable means to release the potential of this engine using a state of the art induction package. Injectors - the standard ones are fine up to 200bhp else high impedance items (like the pico 330) are recommended. *ECU will come loaded with a base map which matches your setup as closely as possible. However, this, as with all generic maps, will still need fine tuning on a dyno.